BT, which currently operates street furniture concessions across nine local authorities (Glasgow, Cardiff, Brighton, Plymouth, Carlisle, Newcastle/Gateshead, Nottingham, Gloucester and Leicester), is proposing to end its exclusive agreements to encourage other local authorities and the wider industry to adopt an alternative ‘open access’ model. BT says the current concession model favoured by many local authorities, which grant a single mobile operator or infrastructure provider exclusive access to council-owned street furniture such as lamp posts and CCTV columns, discourages investments from other operators and will stymie the rollout of 5G small cells. Car2MEC, a project funded by the Bavarian Ministry for Economic Affairs, wrapped two years of intensive trialing and testing by Continental, Deutsche Telekom, Fraunhofer ESK, MHP and Nokia on the A9 motorway digital test track in Germany. The project mission was to gain insights into the value of MEC for connected driving with regards to technology and network architecture as well as economically. The project partners tested a number of different use cases on the A9 motorway, including "emergency warning", "end of jam warning", "variable speed limit assistant" and "HD maps". For the motorway test set-up, Deutsche Telekom deployed two locally separated MEC nodes based on Nokia's technology. The testbed shared resources with the LTE live network and had been operated for 12 months allowing for extensive test drives. Fraunhofer ESK's hybrid communication units enabled a highly-efficient distributed messaging service (GeoService) on the multi-access edge nodes. MHP provided insights into MEC's value for connected driving from a business perspective. 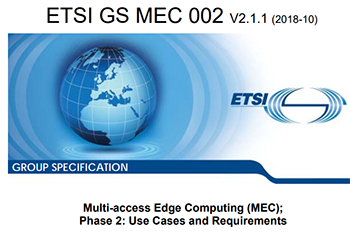 The ETSI Multi-access Edge Computing group (MEC ISG) released the first set of its Phase 2 specifications, including ETSI GS MEC 002 which includes new requirements for Phase 2, ETSI GS MEC 003 dealing with architecture and framework, and ETSI GS MEC 009 giving general principles for service APIs. The updated specs focus on the integration of NFV integration. The specification also describes example use cases and their technical benefits, for the purpose of deriving requirements. In addition, the release includes a report on MEC support for vehicle to infrastructure and vehicle to vehicle use cases. “With this Release, the group continues to strengthen the leadership role that ETSI has played in edge computing since day one. I am proud of the quality of the work this team keeps delivering, making sure that the MEC marketplace evolves to an efficient, interoperable and open environment” says Alex Reznik, MEC ISG Chair. Molex has joined the Networking for Autonomous Vehicles (NAV) Alliance, which was created to drive the ecosystem development required for the next generation of Multi-Gig Ethernet networking in vehicles. The NAV Alliance also provides a platform for the automotive industry to create innovative in-vehicle network infrastructure solutions for autonomous vehicles and facilitate wide deployment of networking technologies and products. NAV was founded in July 2018 by Aquantia, Bosch, Continental, NVIDIA, and the Volkswagen Group of America.